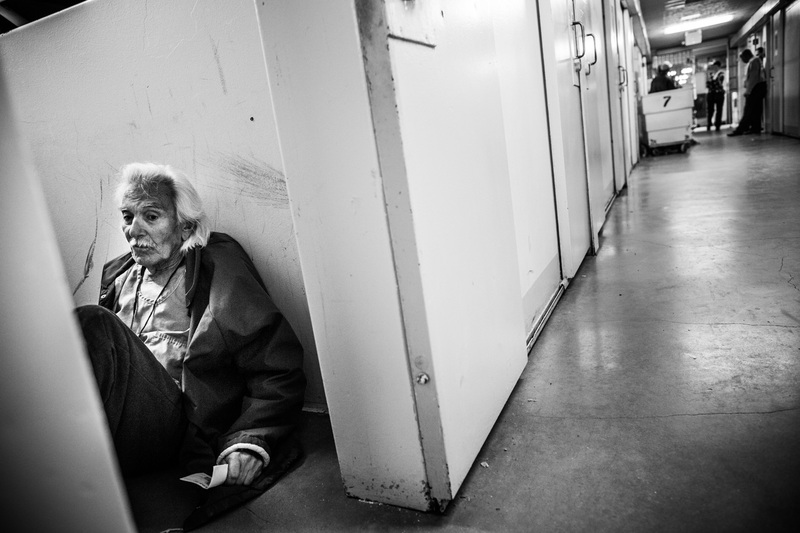 Anthony Alvarez, age 82, waits for the daily prisoner count while sitting on the floor of his cell at California Men's Colony prison on December 19, 2013 in San Luis Obispo, California. Alvarez is helped by the Gold Coats, a volunteer care program where healthy prisoners volunteer to take care of elderly prisoners who either need general assistance with mobility and every day life or who also struggle with Alzheimer's and dementia. The program, the first of it's kind in the country, has existed for approximately 25 years. According to Alvarez, he has been incarcerated for 42 years due to a series of burglaries, possession of illegal firearms and escapes from county jail. Eventually these convictions led to him getting a life sentence due to three-strike laws. "I never shot anyone," Alvarez said, "I had the chance but I could never shoot anyone." Today is Alvarez's first day being assisted by the Gold Coats; he largely needs help with mobility. Alvarez tries to work out for a few minutes every other day. He says he would like to apply for compassionate release, a program where prisoners are released from prison after being found no longer a threat to society, or if a doctor deems that they are within the last six months of their life.